Original seeds come from Craig Lehoullier who sent Cherokee Chocolate seed to Darrell Merrell. Darrell returned this off type back to Craig who in turn sent them to Dr. Carolyn Male, who offered them in Seed Savers. Heirloom Seed Packet. 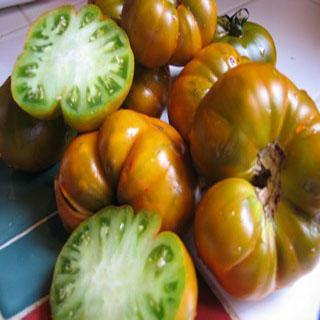 Medium fluted green fruits with gold blushing when ripe. Receiving excellent flavor reviews from many growers as a very tasty green. Plants have strong growth habits and production is wonderful.